This is my first blog from the basement. Not the first since we moved here, but the first composed in our actual subterranean accommodations. We didn’t end up taking a road trip this week, there was too much to do on the home front. Been finishing the landscaping at the new house for the better part of the week. Getting down to the wire; fall will soon be in the rearview mirror, I can see winter up ahead. Need to make sure all my leafy friends are tucked into the soil and comfortably rooting before it gets frigid. A lot of work now, but next spring and summer will be the payoff. Worth the aching back. This is my fourth yard from scratch. I’ve got chops. (Especially around the bargain table, if a plant is on its last legs, it comes home with me.) You see, I have this thing about bringing broken down back to life. The first tree I ever planted was from a discard pile. They practically paid me to take it off their hands. Charlie Brown tree if ever there was one. But to me, it was a beauty of a Red Maple; just like Chuck, I was in the bag for the scrawny little guy. I pampered and pruned that pup for years, by the time we left that house, it was a grand, towering specimen. Someone at one of our gatherings said it was the most perfect tree she had ever seen. Always knew he had it in him. Trees are a lot like people, all they want is a chance. Give them decent nourishment and some love and they thrive. Along with tending my new gardens, I’ve been working here, in the basement yard too. This one is a doozy; there are, literally, hundreds of trees in this yard. Big, mature monsters. No exaggeration. And with a forest comes, leaves. A sea of them. 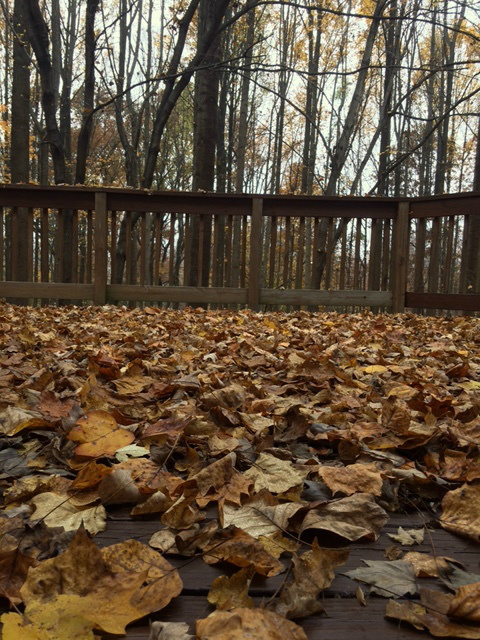 Seriously, we are inundated with leaves. They’re e v e r y w h e r e. I rake the long driveway and surrounding beds clean and two days later, they’re completely covered again. Not sure, but I think the rake is now an appendage. Today was devoted to the forest. Other than dragging my ten, gallon jugs over to the house to water, I spent the entire day working here. I make it sound like a chore, it’s not. I mean, yes, by the nature of it, (pun intended,) yard work is a chore; but it falls in the same category as shoveling snow, I enjoy it. And today was dreamlike; I felt like a kid. Had to stop several times and just be in the moment. Imagine being surrounded by hundreds of wise, old behemoths sprinkling brilliance all round you. It was warm and the sun was shining between the giants. And the leaves were fluttering down like a gentle rain of twirling magic. I took video until my phone was dead. It was just so enchanting. Brought to mind one of my favorite poems. Years ago, I committed two poems to memory. The first was a college assignment, a Shakespeare sonnet that fits me to a T. (I think ole Will and I are kindred spirits.) And the second I learned after I got out of school, simply because I loved it. Joyce Kilmer’s poem, Trees. His striking verses speak to how very much like people they are, “…A tree whose hungry mouth is pressed, against the earth’s sweet flowing breast…” Nurturing, that’s the ticket. We’re hungry to be cultivated. All of us. There are no lost causes, trust me, it’s never too late. Give up on something too soon and you may never see its brilliance. I’m going to keep planting. The payoff is priceless.